I love when a project turns out exactly as I envision it in my head! I had been wanting to try die cutting and embossing vellum for quite some time and was very pleased with my results. I used Spellbinders Butterflies 2 die and the great thing about all Spellbinders dies is the embossing feature -- it turned out gorgeous on vellum, leaving a slightly white color to the embossing! Only Spellbinders dies has the embossing capability. I enhanced the embossing on the butterfly wings with Star Dust Stickles. The butterfly is attached by its body being glued with Beacon Adhesives' Zip Dry Paper Glue to the card and the wings left to flutter about! The image underneath the vellum butterfly is the coordinating Spellbinders Butterflies 2 stamp image that was stamped with Ranger Adirondack Cranberry dye ink onto Stampin' Up's Vanilla smooth cardstock. The image was then die cut with Spellbinders Classic Circles and the Reverse Stenciling technique used -- this is simply attained by inking the die with Adirondack Cranberry pigment ink. The ink is then transferred to the cardstock during the cutting and embossing process (be sure to clean your die afterwards!). Then I heat embossed the ink with sparkly embossing powder. The butterfly's background was splattered with R39-Garnet Copic Sketch marker using Copic's Airbrush System. Some Flame Dew Drop acrylic embellishments finish off the front of the circle and it is backed with thin chipboard (from a cereal box -- yes, your Spellbinders dies will cut through this thickness of chipboard! ), to give it some stability. The Fancy Pants felt swirl was originally bright red but I also airbrushed it with the same R39 Copic marker so it would match the butterfly. The standard A2-sized (4.25" x 5.5") card base is WorldWin's ColorMates Deep Racy Raspberry and the patterned paper is Fancy Pants Aged Florals. The paper edges were distressed and machine stitched to the card base. Some more Flame Dew Drops balance out the card on the lower right. Check back in this week, I'll have two more Spellbinders projects to show you! To celebrate Nestabilities tremendous first year, Spellbinders will be giving daily sneak peeks of many of the new die designs debuting at the upcoming Summer Craft & Hobby Association Show --- in addition YOU have an opportunity to win some great prizes! A new Raspberry Wizard Die Cutting & Embossing Machine and $500 in dies!!! To learn more about this opportunity please head over to Spellbinders home page for the list of blogs, the prize information and other fabulous details surrounding this grand event! Also, if you would like to be notified directly by Spellbinders regarding future product releases then click on the link below and sign up for new information to be delivered to your email box. I'll be doing my sneek peak reveal on July 10, so be sure to check back for a chance to win. The fun all starts TOMORROW, Monday, June 30th at my buddy, Debbie Olson's blog! But check back in here next week, too -- I'll have three Spellbinders projects to share with you! I agree with many of the previous comments, featuring a product or tips on your fave products would be awesome!" Congratulations, Emily -- please send me your mailing address and I'll get these out in the mail to you . . . enjoy!! And thanks to everyone for your suggestions -- I will certainly be implementing many of them and doing some new features here on the blog! Be sure to check back in next week, I'll have my May Spellbinders gallery projects to share with you. Many of you commented that you'd like to see more projects using Spellbinders dies, so stay tuned . . . Have a wonderful weekend! I was bouncing in my chair Monday when I received an email from Taylor telling me I won her Cupcake Sketch Challenge from last Friday! That means I get to join her regular Cupcake Girls and be the Featured Cupcake Sampler on her blog this week, by providing a sample for her sketch. Thanks so much, Taylor, I'm very honored! Since June is coming to an end and I remembered I hadn't made my July calendar page yet (if you are new here, you can read about my calendar pages and holder here and view all of them in the Calendar Photo Album over in the right sidebar of my blog), I decided to use the sketch for that and it worked perfectly! The colors I chose for the Inchie match those in this BasicGrey Sugared paper -- I really liked the deeper shade of red. I also chose this stamp because of the sweet little American flag snuggled in the bouquet of flowers . . . I thought it was perfect for July! The flag and baby's breath in the bouquet are accented with Ranger's opaque white pen. I stamped and cut out another flag and centered it on the calendar, then sponged the edges of the calendar with Ranger's Antique Linen Distress Ink. The calendar is a computer generated one I made and can be downloaded from this post. The Inchie is matted with Spellbinders Nestabilities Classic Scalloped Square (smallest of the large set). The July lettering is cut from red paper with Spellbinders Excalibur Alphabet and adhered to a gold Tags 5 die cut tag. Striped paper is machine stitched with chocolate thread (all paper is BasicGrey Sugared). The scalloped green (upper horizontal "awning") and scalloped gold (lower horizontal strip) papers were cut with Spellbinders Mega Nestabilities Scalloped Long Rectangles (largest of the large set) -- I love that this die expands over a full 6-inch page! Stampin' Up chocolate taffeta ribbon and brown Cindy brads finish off this calendar. Head on over to Taylor's blog to see the sketch and wonderful samples by Taylor's fabulous Cupcake Girls . . . I hope you'll play along! Don't forget to check back in a little later . . . I'll announce the winner of my 400K Giveaway by noon Central time. Wow, we passed over 400,000 hits here on the blog in the past 1-1/2 years I've been blogging and I'd like to say thanks to all of you who've found me in cyberspace and keep coming back! This type of stamper is the hand-held wooden kit you see in the back which includes the Special Occasions fancy cursive font (large and small). The rings in the front two packages can also be used on the stamper, for a different look. One is Damask Borders and the other is Library of ... Kitchen of ... Desk of ... borders set. You'll be able to ink these on your regular ink pads, too, or use dye-based markers on them. All you have to do to be entered in the random number generator drawing for this gift is give me an idea of a feature you'd like to see me do here on the blog -- a certain technique, how to make a certain type of card/project, a weekly challenge or ??? I'd love to hear your suggestions! I'll close the drawing Thursday night, June 26th at midnight Central time and post the winner by Friday at noon Central time. Thanks and good luck! I don't know what rock I've been living under (probably just a blonde moment! ), but I just recently discovered Taylor's weekly Cupcake Challenge is simply a sketch challenge and you don't have to use a cupcake image to play along! Well, you know how much I love sketch challenges, so I thought I'd participate this week . . . Even though I have a few cupcake stamps, I decided to use a little bit older Lockhart image I've had that hadn't seen ink yet and discovered this Dragonfly is a simple, quick pleasure to color and perfect for a summertime hello! I stamped her (it has to be a she because of all the pink, right?!!) with Tsukineko's Memento Rich Cocoa ink on Poison Ivory cardstock and colored her with Copic markers R81, R83, E15, Y21 & W2 for shadowing, to match this BasicGrey Sugared paper. For the sentiment circle, I was determined to finally use the Just Rite Stamper I've had for a while. I really wanted to use the C45's outer flower ring from the DIY Monogram Stamper Curlz Font kit, but the overall size was larger than I wanted for the accent of this card. So after stamping the floral ring with the Rich Cocoa ink, I punched out some of the flowers and adhered them individually to a smaller 1" circle I stamped with "Hi" from the smaller Curlz font and punched out. I liked the larger flower effect this created. The chocolate mat is 1.25" and my overall card size is 4.5" square. Did you know Flourishes is now carrying the Just Rite Stampers? And I see Taylored Expressions does, too . . . I can't wait to play with this more, now that I took the time to figure it out! Additional supplies -- Paper: BasicGrey's Sugared 6x6 pad, SU Chocolate and Pretty in Pink. Accessories: Spellbinders Nestabilities largest Large Classic Circle and largest Large Scalloped Circle, Mens Dew Drops, Stampin' Up Chocolate taffeta ribbon. I hope you have a wonderful week and I hope to get the time to share some more creations with you this week! For Beate's Weekend Sketch Challenge this week, I decided to use the sketch on my Inchie Arts Inchie Index book that I hadn't yet altered. Granted, this little book is a lot smaller than the sketch, but this is my squattier version! Then you can number the Inchie on the back with its corresponding number from the Index and store the Inchies in your Inchie Binder . . . It's a great reference tool! When I was coloring my Inchie, this Webster's Pages paper immediately came to mind but when I got it out to cover this tiny book, I realized not much of the large pattern would show on such a small book. Then I happened to glance over at the Webster's catalog that had come with my order and noticed all the scaled down prints in it, which lets the consumer see what all of their papers look like. This little snippet of the Sweet Charity paper was just the right size to cover the cover of my Index book! After un-binding the book and covering it with the papers (using Beacon's Zip Dry Paper Glue), I inked the edges with Ranger's Antique Linen Distress Ink and added the chocolate braid trim. I used the Antique Linen Distress ink to ink the edges of my Inchie and matted it with chocolate cardstock cut with Spellbinders Nestabilities Scalloped Square. Lori challenged me to turn my Inchie on the diagonal, so here it is! I hope you'll check out the blogs of Beate, Cambria Turnbow, Charmaine Ikach, Jenn Balcer, Laurie Schmidlin, Lori Craig and MaryJo Albright for some more wonderful inspiration for this sketch! Have a wonderful weekend! This Spellbinders gallery project was also a design team challenge to use a die in a different way than originally intended. I used the Horse & Rocker top (just the horse, not the rockers) and the rod from Charms & Rod to create this carousel horse! He is popped up on foam tape, for added dimension. My oldest daughter has always loved carousel horses and we've traditionally gotten an annual photo of her on the beautiful carousel at our state fair. This visit was our youngest daughter's first ride (she was just a little over 1 year old)! Spellbinders alphabets used were Julius & Whimsy. The Carousel lettering and horse's embossed parts were accented with purple Copic Spica glitter pen. Nestabilities Large & Small Classic Circles were used for the mat for the horse. WorldWin DoubleMates (textured) Cardstock in Deep Groovy Grape-Rich is the 12" base. Other cardstock used was ColorMates Deep & Medium Groovy Grape, medium/dark/deep Terrific Teal and Deep Ocean Blue. Gold metallic cardstock from Stampin' Up was used for the carousel horse rod, to match the ones in the photos! Patterned paper is from Fancy Pants' Kewl collection. Jewel-toned glittery brads by Creative Impressions on the tag and lower corners & navy braided trim finish off this page. I'll be back tomorrow with Beate's Weekend Sketch Challenge! Well, half the week is over and I'm just now getting around to posting the Father's Day card I made for my husband . . . such is the slow life of lazy summer! Thank goodness CPS69's sketch was up early Sunday morning, so I could quickly get this card made before our afternoon family gathering. That really made this card come together quickly! I already knew I wanted to use Karen Lockhart's Hawaiian Shirt for hubby's card because those loud tropical print shirts are what he constantly wears in the summer, especially on vacation! You can also see by this closeup that I crumpled the shirt and adhered it to the tag with dimensional foam tape to keep that crumpled shape . . . after all, that's pretty much what your clothing looks like out of the suitcase when on vacation, doesn't it?!! To keep that clothing feeling going on this card, I machine stitched double straight lines with chocolate thread on the right side of the tag. I dug thru my stash and found this BasicGrey Hang Ten paper & tag to use for this 4-1/2" x 6" card. Ellen Hutson put together a great kit using some of these same papers and stamp. You can find the kit here and the instructions for her great little book here. This stamp and kit would be great for any masculine occasion you might have and the shirt is so much fun to color! Some Stampin' Up Chocolate taffeta ribbon and a great BasicGrey (K&Company) embossed leather-look sticker I found some time ago at Michael's finish off this card. I hope you had an enjoyable time with your family/father this weekend, or fondly remembering your father that might not still be living here on Earth . . . like I did. :) I'll be back tomorrow with another Spellbinders project! A week sure has flown by quickly since Beate's last Weekend Sketch Challenge . . . especially since this was the first full week of summer vacation for us! << Here's this week's sketch. So in honor of summer time and Flag Day tomorrow, I thought Karen Lockhart's new Picnic stamp would be appropriate for this week's sketch . . . The image was cut out and matted with the same navy print from BasicGrey's Boxer 6x6 pad that is the far left vertical strip of the sketch. The red print is from BasicGrey's Cupcake line. These two prints were machine stitched to the card. A little bit of paper piercing at the bottom of the Memory Box Holly Berry notecard and some Flame Dew Drops finish this card. I hope you'll try this sketch this weekend and don't forget about Ellen Hutson's Friday the 13th sale going on today. You can see this post for all the details. Everything in Ellen's store is included in the sale, even this brand new Lockhart Picnic image I used today, which is included in Ellen's Stamp of the Month packet (also on sale)! Be sure to shop early because once quantities run out, there are no backorders. All supplies for today's card available from Ellen Hutson LLC. For more wonderful sketch inspiration, please visit the blogs of these ladies to see what their interpretation was: Beate, Cambria Turnbow, Charmaine Ikach, Jenn Balcer, Laurie Schmidlin, Lori Craig and MaryJo Albright. Friday the 13th Sale & Newsletter Sneak Peek! Do you know what tomorrow is? The only Friday the 13th of the entire year! And that means it will be a good day for you over at Ellen Hutson LLC. Ellen is having another one of her infamous Friday the 13th sales. For 13 hours between 6am & 7pm PST, you will receive a 13% discount on your ENTIRE order! 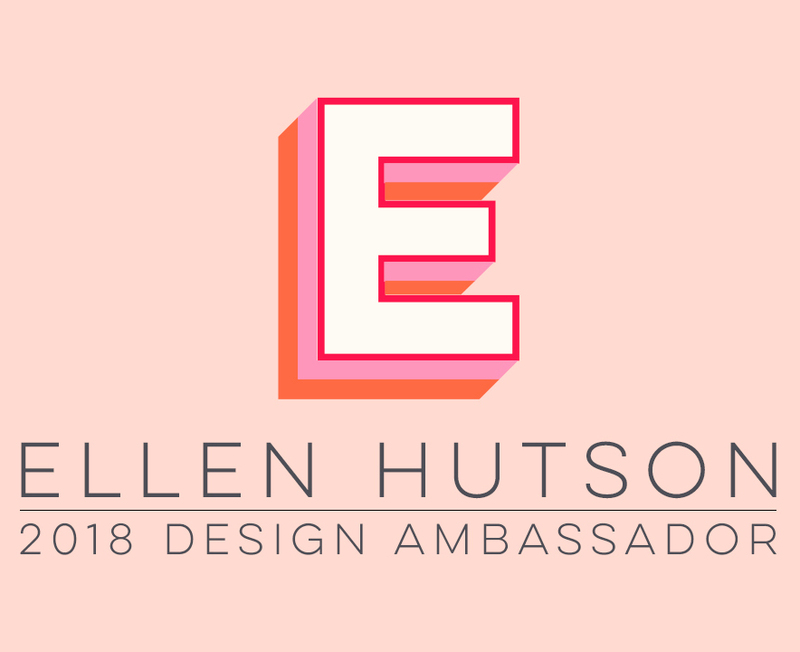 If you didn't receive your Ellen Hutson LLC In Touch special event emailed newsletter this week that detailed the sale & special promotion code, you can go to the bottom of Ellen's homepage and sign up to receive future newsletters. For this sale, just be sure to enter promotion code 131313V3 when you reach the checkout page. You can use this discount code on ANYTHING in Ellen's store . . . those 31 brand new Lockhart stamps, Copic markers, Nestabilities, you name it! As long as it's showing in the store, it's on sale! I love that Lockhart Electric Fan! I'll be back tomorrow with Beate's Weekend Sketch Challenge that will use Ellen's Stamp of the Month! Earlier this year, I found this iron holder with metal flower pots on sale at Hobby Lobby and thought it might make a good altered project down the road. That time came in April when I was designing my monthly Spellbinders gallery project. The pots were already this rustic white color and I decided to dress them up a bit with a technique one of the Spellbinders Design Team members (Heidi Blankenship) did the previous month. (Here's a link to Heidi's gorgeous bird feeder!). First, I used Spellbinders Daisy Delight die to cut & emboss craft foil flowers. You can find the foil either directly through Spellbinders or Ellen Hutson carries it, too. It's thicker & sturdier than regular kitchen aluminum foil and comes in different colors, which reverse to silver. I used the silver side for the flowers. Next, I glued the foil flowers to the metal pot using Beacon Adhesives Dazzle Tac Jewelry Glue because it said it was incredibly strong and would hold well with all kinds of metals/jewelry -- and they were right! (Click on photos for a larger view). << Next, I dry brushed a little green acrylic paint on top, to bring out the embossing. Now for the garden stakes . . . I found those at the Target Dollar Spot this Spring, 4 in a package for $1! They already had the copper metal wrap and this is what I did to get the herb names on them: This time I used the colored side of my green foil and the Whimsy alphabet to cut the letters for my words. I used Copic marker E08 to outline the letters, give them a bit of a shadow and the copper an aged look. I thought the oval handle on this planter would look cute with Karen Lockhart's Gardener's Clogs and this sentiment: Gardeners know the best dirt! The clogs were stamped once on the green BasicGrey Boxer paper, once on the white patterned paper and once on the rust paper. I cut out the insides of the red paper clogs and adhered them to the insides of the white clogs. Then I cut out one white shoe and adhered it to the green paper (left), and cut out the other white shoe and popped it (right) up over the other shoe. Copic marker E08 was used gain to color the soles of the shoes. YG63 Copic was used to color the grass and ground shadow. Some rust colored Creative Impressions wide grosgrain ribbon ties this sign onto the planter and finishes it off. Sorry for the long post, but I hope this project helps you look at your dies in a new way and gives you some inspiration to try cutting some out-of-the-box things with them . . . they aren't just for cardmaking or scrapbooking! Everything you need to know about how to use Spellbinders dies is now available in step-by-step videos on You Tube made by Stacey Caron, Co-owner of Spellbinders. How to use Spellbinders dies in your Cuttlebug. How to use Spellbinders dies in other manufacturers' machines. 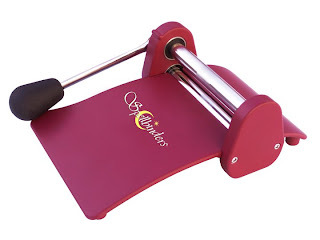 How to use other manufacturer's dies in Spellbinders' Wizard die cutting & embossing machine. I've also put these links on my left sidebar, under "Spellbinders Links", for quick & easy reference! I'll be back a little later with another Spellbinders project -- it's just taking me a little while to write it up. Beate's Weekend Sketch Challenge #51 went together very quickly and is one I'll use over and over again -- I loved it and hope you'll try it, too! Memory Box Raspberry note card is the base of this card that matched the bright pink flowers in the BasicGrey Sultry paper perfectly. Papertrey Ink's Spring Moss satin ribbon carries out the top horizontal element of this sketch and Spellbinders Mega Nestabilities Long Scalloped Rectangle die cut the Raspberry strip at the bottom, for balance. The cupcake image was cut and matted with Spellbinders Nestabilities Classic Ovals dies (large & small sets), given a little bling-bling of pink crystal gemstones, and is popped up on dimensional foam tape. Copic Spica glitter pens in clear and pink accent the rose buds and what I'm calling chocolate sprinkles . . . Since this image is a mix between flowers and a cupcake, I made it a chocolate cupcake with chocolate sprinkles! You can check out some other samples of this sketch by visiting the blogs of these ladies -- I'm sure you'll find some very inspiring ideas from them! Beate, Cambria Turnbow, Charmaine Ikach, Jenn Balcer, Laurie Schmidlin, Lori Craig and MaryJo Albright. If you play along in the sketch this weekend, be sure to let me know so I can check out your creation! Digi & Karen Lockhart New Release! I know I promised another Spellbinders project for yesterday, but with the final days of school this week, I've been busy! I'll try to get that up for you later today or tomorrow. I've just barely started dabbling in digital scrapbooking and this free page each month has helped a bit -- it's easy to just pop your photos into the frames and pre-made page. I hope you'll try it out, too! All the stamps are already available for sale at EllenHutson.com. I hope to have some samples for you as soon as they arrive on my doorstep!